Early excision in case of osteochondroma of scapula leads to complete cure and waiting till skeletal maturity is unwarranted. Department of Orthopaedics, Regional Institute of Medical Sciences, Imphal, Manipur, India. 109, Gent’s Hostel-5, Regional Institute of Medical Sciences, Lamphelpat, Imphal – 795 004, Manipur, India. Introduction: Osteochondroma is a benign bony lesion with cartilaginous cap occurring usually in long bones, but flat bones may also be involved, either isolated or as a part of a syndrome. Usually, they are asymptomatic, but appearance of symptoms such as mass effect may warrant surgical intervention, which is usually delayed till skeletal maturity. 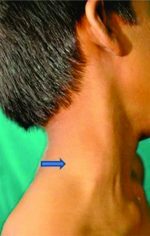 Case Report: A 4-year-old male child presented with swelling on ventral aspect of inferior angle of scapula associated with pain, pseudowinging of scapula, and snapping sound of the left shoulder on movement. Despite young age of the patient, the severity of the symptoms required immediate intervention. After preoperative workup and planning, the mass measuring 4 cm × 3 cm × 2.5 cm was resected completely, following which the patient was relieved of all the symptoms without any recurrence for the next 7-month follow-up. Histopathological examination confirmed the diagnosis of osteochondroma. Normally, as the growth usually stops after skeletal maturity, surgical intervention is delayed till that time. In our case, the symptoms were so debilitating that it required immediate surgical resection, following which the patient was symptom-free for the next 6 months and there were no clinical signs or symptoms of recurrence. Conclusion: Excision of osteochondroma can be safely performed in a case, where it is debilitating, progressive, or unmanageable much before skeletal maturity with fair results. Keywords: Osteochondroma, scapula, pseudowinging, snapping scapula, resection. Osteochondroma is a benign, surface neoplasm of the bone and cartilage of unknown etiology though sometimes it is considered more of a physeal defect than a tumor . The most common site of origin is the metaphysis of tubular long bones, with the distal femur, proximal tibia, and proximal humerus constituting 90% of the occurrences. Flat bones are a relatively rare site for osteochondroma with a 3-4.5% involvement of the scapula . Even though osteochondroma is the most common neoplasm of scapula, it occurs very rarely in the isolated form, i.e., not part of generalized disorders such as hereditary multiple exostosis, especially in the ventral aspect of the scapula. They are common at childhood and adolescence, in the first two decades of life, and stop growing after skeletal maturity. Usually, they are asymptomatic, but sometimes, they may present with features such as prominence of the lower border of scapula (also known as pseudowinging so as to differentiate from true winging of scapula which is due to weakness of serratus anterior muscle, usually secondary to long thoracic nerve palsy), snapping scapula (palpable, audible, and painful crepitus of the scapula during movements), bursa formation, chronic pain, and severe cosmetic deformities [3, 4, 5, 6]. Very few cases have been reported where excision of ventral inferomedial scapular exostosis has been done as a part of management of shoulder pain and snapping scapula syndrome and that too have been done in each instance after skeletal maturity [4, 7]. We hereby present a very rare case report of a solitary exostosis of ventral inferomedial angle of scapula in a 4-year-old boy who had to be excised en bloc before physeal closure due to the severe degree and progressive worsening of the symptoms and later monitored carefully for prevention of recurrences. A 4-year-old male Muslim boy from Lilong, Manipur, born of non-consanguineous marriage presented to the Orthopedic OPD with swelling on the left side of the upper back (Fig. 1). The patient’s mother noticed a small, painless, and non-tender swelling arising from the undersurface of the left scapula when the child was 1½ years old while giving him a bath. It was not associated with fever or inflammation of the overlying skin. The swelling gradually increases in size thereby causing increasing prominence of the inferior and medial portions of the left scapula ultimately leading to snapping sound on shoulder movement. There was no marked elevation of the medial border of the scapula on pushing against the wall except for soft tissue retraction making it more prominent, the pseudowinging scapula. All neuromuscular examinations were normal. It was also associated with pain which was not severe enough to restrict shoulder movements. He had slight discomfort on lying down in supine. The child’s own self-esteem became affected as his friends starting making fun of it. The parents had not consulted any doctor on account of financial constraints and the hope that the swelling may subside spontaneously as the patient grows older. At the time of presentation in our OPD, the swelling measured about 3 cm in length (medial to lateral) situated at the ventral aspect of the scapula near the inferior angle. 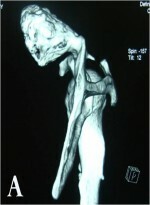 Having explained the need for proper workup of the condition and having taken valid consent, routine investigations, X-rays, and computed tomography (CT) scan (Fig. 2 and 3) were taken with financial assistance from the authors. Imaging reports revealed a large pedunculated (mushroom-like) bony outgrowth from the ventral aspect of the left scapula near the inferior angle with continuous medulla with the parent bone. Excision of the swelling was done with the patient in semiprone position (the child being small built, prone position was inconvenient) with the left upper limb fully internally rotated to elevate the medial border of the scapula. 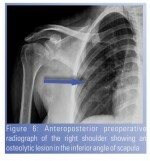 A 5 cm incision was placed parallel to the lower half of the medial border of the left scapula (Fig. 4), trapezius incised along the skin incision. Rhomboideus major was then incised and the swelling was exposed by retracting the soft tissues subperiosteally. The whole swelling was excised using osteotome (Fig. 5). The incised muscles were properly re-sutured and bleeders cauterized. The excised tissue measured 4 cm × 3 cm × 2.5 cm (Fig. 6), with the cartilage cap measuring about 3 mm in thickness (Fig. 7). 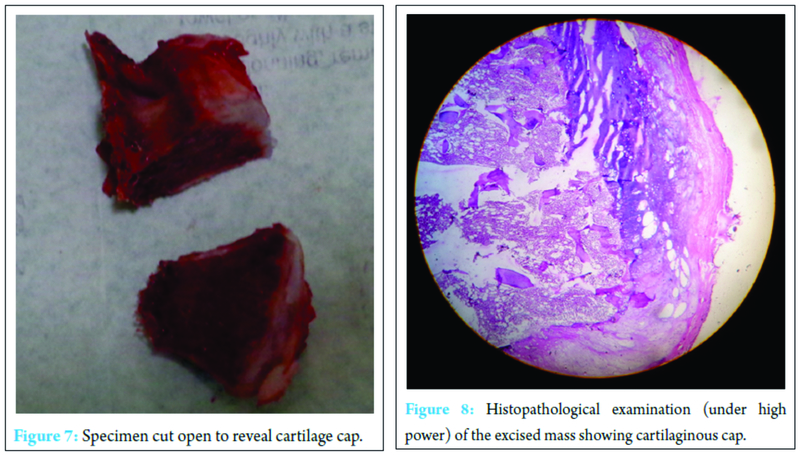 Histopathological examination showed thin cartilaginous cap with enchondral ossification toward the base, with underlying trabecular bone along with hematopoietic marrow and fat spaces, which confirmed the clinical diagnosis of osteochondroma (Fig. 8). Pendulum exercise was started after 48 h postoperatively. There was dramatic improvement in symptoms following excision. The patient is being followed up regularly keeping in mind the higher chance of recurrence as compared to those in older children. There was no sign of recurrence till the last follow-up visit at 6 months following surgery. Usually, osteochondroma does not produce any symptom unless it is big enough to produce any mass effect . In the case described by us, although the child was only 4 years old, the tumor was large enough to produce distressing symptoms which directly affected the quality of life of the child. Solitary exostosis or osteochondroma of the underside of the scapula may produce static winging and snapping shoulder syndrome [3, 6, 7, 9, 10]. The snapping scapula syndrome was first described by Boinet in 1867. Since then, case reports of painful snapping scapula due to scapular osteochondroma have been infrequent. The syndrome presents with pain in back and around the shoulder girdle with audible and/or palpable crepitus of scapula on scapulothoracic movement . In this case, apart from the scapula being prominent, it also was associated with considerable pain and palpable crepitus on shoulder movements. Sometimes, there may be a large bursa formation associated with the scapular osteochondroma, which was not seen in this patient . Plain radiography is the main diagnostic modality. Anteroposterior and lateral radiographs are sufficient to characterize the lesion. In certain bones such as the pelvis and the scapula, a CT scan is useful to localize the lesion when planning resection as was done in this patient. Magnetic resonance imaging is needed only if malignancy is suspected. A bone scan is not useful . Accordingly, we had taken a CT scan for confirmation of the diagnosis, localization of the mass, and also for preoperative planning. Histopathology of osteochondroma shows enchondral or lamellar bone connected to normal bone by a thin stalk in continuity with the medullary canal of the native bone . In our case, the mass was found to be sessile. Thickness of the cartilaginous cap seen in the biopsy specimen also is one of the predicting factors for malignant transformation . A cartilaginous cap thickness <1 cm indicates a benign condition whereas a cap, thicker than 2 cm should raise concern for malignant transformation [6, 7]. Osteochondromas usually stop growing at the time of closure of the physis, and growth into adulthood should also raise suspicion for possible malignancy. As we had removed the entire mass with some margin, there is very less chance if any of such an occurrence. There were no clinical and radiological signs of recurrence of the illness in our patient at 6-month follow-up (Fig. 9 and 10). The child will be followed up carefully until after puberty to rule out such an eventuality. In solitary osteochondroma, local recurrence after resection is <2%. Conventionally, the approach to the management of symptomatic ventral osteochondroma of the scapula is resection when the patient has achieved skeletal maturity. However, in case of severe symptoms, surgery may be anticipated. In our review, we found the earliest age of resection of ventral osteochondroma to be 8 years . In our case, the resection was performed at 4 years of age and has not shown any feature of recurrence even at 6-month follow-up. We may therefore conclude that delaying surgery in case of symptomatic osteochondroma of the ventral scapula has no added advantage and complete resection of the mass can yield equally good results even when performed in early life. Waiting up to skeletal maturity for excision of symptomatic osteochondroma of ventral scapula may increase morbidity and hence unwarranted. 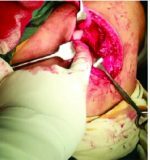 In these cases, meticulous and complete excision of the mass can be performed safely without significant risk of recurrence. 1. Edelman RR, Hesselink JR, Zlatkin MB. Clinical Magnetic Resonance Imaging. Vol. 3. Philadelphia, PA: Saunders Elsevier; 2006. p. 2320-2327. 2. Frank RM, Ramirez J, Chalmers PN, McCormick FM, Romeo AA. Delayed presentation of osteochondroma on the ventral surface of scapula. Int J Shoulder Surg 2012;6(2):61-63. 3. Lazar MA, Kwon YW, Rokito AS. Snapping scapula syndrome. J Bone Joint Surg Am 2009;91(9):2251-2262. 4. Puthoor DK, Benign LW. Cartilage lesions. In: Kulkarni GS, editor. Textbook of Orthopedics and Trauma. 2nd ed. New Delhi: Jaypee; 2008. p. 1020-1027. 5. Okada K, Terada K, Sashi R, Hoshi N. Large bursa formation associated with osteochondroma of the scapula: a case report and review of the literature. Jpn J Clin Oncol 1999;29(7):356-360. 6. Cooley LH, Torg JS. “Pseudowinging” of the scapula secondary to subscapular osteochondroma. Clin Orthop Relat Res 1982;119-124. 7. Dharmadhikari RP. Painful snapping and pseudo-winging scapula due to a large scapular osteochondroma. J Orthop Case Rep 2012;2(2):10-13. 8. Milch H. Partial scapulectomy for snapping of the scapula. J Bone Joint Surg Am 1950;32-A(3):561-566. 9. Danielsson LG, el-Haddad I. Winged scapula due to osteochondroma. Report of 3 children. Acta Orthop Scand 1989;60(6):728-789. 10. Fiddian NJ, King RJ. The winged scapula. Clin Orthop Relat Res 1984;228-236. 11. Erlemann R. Benign cartilaginous tumors. Radiologe 2001;41(7):548-559. 12. Adeoye PO, Habeeb OG. Scapula exostosis with pseudo winging: A case report and review of literature. J Surg Surg Sci 2007;1(1):34-37.